Extent of glaciation in Kansas and location of the ice-sheet terminus is best determined by mapping the distribution of Sioux quartzite erratics. Even the presence of less than 1% quartzite in a basal chert-limestone gravel is evidence of a temporal and spatial relationship with a glacier. From Wamego to Topeka, the terminus can be located within very narrow limits. Not as clearly defined is the amount of post-glacial erosion that has or has not been accomplished. Ridge-top concentrations of quartzite boulders may be paleovalley lag concentrates preserved by topographic reversal or, conversely, primary concentrations marking the bottoms of major crevasses. Till units of contrasting lithologies, as well as till units separated by a paleosol, provide evidence of at least two advances to the terminal zone. At maximum advance, glacier ice blocked the Kansas River, impounding a lake that extended more than 100 km (60 mi) upstream. Flow over a spillway at 1,165 ft (350 m) above sea level proceeded to Topeka through several small ice-front lakes. In North America, glacial theory and history understandably developed mainly where the records of past glaciations are most clear. This was in those states bordering the Great Lakes. There the deposits and land forms are youngest, hence best exposed, least modified, and so easiest to understand. This region, extended to included Iowa, has been the cradle of American Pleistocene history and reconstruction. Only the older ice sheets advanced into northern Missouri, northeastern Kansas, and southern Nebraska. Their deposits are thin and scattered and few, if any, actual glacial land forms remain. The history of glacial geology in Kansas was well summarized by Aber in 1984. It will suffice to say here that early field observations by Hay, Smyth, and Todd demonstrated that continental ice had indeed reached north-easternmost Kansas. They recognized effects the presence of the ice sheets had on local drainageways and they delineated the general limits of ice advance, information that was somewhat modified by Schoewe in the 1920's and 1930's. The presence of John C. Frye as Director of the Kansas Geological Survey from 1943 to 1954 led to studies of many aspects of Pleistocene geology and publication of results by students, professors, and Survey staff. The 230 pages of Bulletin 99, Pleistocene geology of Kansas by Frye and Leonard, provided an outstanding compilation of knowledge available in 1952. However, a paucity of detailed maps, sections, and other explanatory diagrams has been a source of constant frustration to later researchers and markedly reduced the usefulness of many of these publications. Although most of their research efforts have been directed toward other geographical areas, Dort, Sorenson, Johnson, and Martin, and their students, have recently modified and expanded details of knowledge about the Pleistocene history of Kansas. Notable impetus has been provided by establishment of a palynological research laboratory at the University of Kansas with support from the General Research Fund and by preparations for the 1986 Friends of the Pleistocene field trip. Presented here is a brief summary of salient aspects of their observations and working hypotheses. A general framework of Pleistocene history was compiled almost a century ago when it was proposed that four major advances and retreats of the continental ice sheets had occurred in both Europe and North America. Only the first two of these advances were believed to have reached Kansas, one (named the Nebraskan) barely entering the northeasternmost corner, the other (named the Kansan) extending as much as 80 km (48 mi) farther south and southwest (fig. 1). Figure 1--Known or inferred termini of the four classical glaciations in central United States (modified from Flint, 1971). Note the position of Kansas at the southwestern limit of pre-111inoian ice sheets. This purported sequence made it very easy to identify till bodies or determine ages of associated sediments. In the far northeastern part of the state, the upper of two tills had to be, by definition, of Kansan age, the lower one, Nebraskan. Deposits of nonglacial origin could, by their position relative to one or both of those tills, be identified as of pre-Nebraskan, Aftonian, or Yarmouthian age. Furthermore, an apparently positive time line could be recognized in many localities where there were exposures of what was thought to be a single regional airfall, the Pearlette volcanic ash. This was assigned a late Kansan age on the basis of indirect stratigraphic correlations. Another time line seemed to be provided by the post-Illinoian Sangamon soil, supposedly the only red pedogenic unit in the Pleistocene section. Unfortunately, all aspects of this simple stratigraphy have been shown to be erroneous. In Kansas, as elsewhere in the world, the former presence of glacier ice is indicated by deposits of unstratified sediment composed of a heterogeneous mixture of grain sizes and shapes--a till. Some of the included fragments bear scratches or striations and the whole deposit may rest on a smoothed and striated bedrock surface. Although most of the fragments in a till body usually are of rock types that crop out nearby, some will have been derived from distant sources. The presence of these far-traveled erratics helps distinguish a glacial till from colluvium formed by downslope movement of rock debris from nearby outcrops. In Kansas, pebbles and even small cobbles of granitic rock could conceivably have been carried by streams flowing eastward from the Rocky Mountains in late Tertiary time and deposited to form the Pliocene Ogallala Formation. Their presence in a sediment does not, therefore, constitute unequivocal proof of a glacial origin. On the other hand, certain lithologies are known to crop out only to the north, and glacial transport to Kansas is believed certain. Chief among these is the Sioux quartzite. Its outcrops are restricted to a small area in southwestern Minnesota and nearby parts of Iowa and South Dakota (fig. 2). Its distinctive pink to lavender color makes even tiny pieces of this rock readily identifiable, so it is an excellent indicator rock. Any sediment containing Sioux quartzite either is of direct glacial origin or was derived by reworking of a primary glacial deposit. Figure 2--Sources of identifiable glacial erratics found in northeastern Kansas. Fragments of Sioux quartzite are common throughout the terminal zone; specimens of ore from the Iron Ranges are scarce. Distribution of Lake Superior agates from the Keweenawan volcanics is highly localized. In addition, it is believed that fragments of metamorphosed volcanics, or greenstone, which are moderately common in northeastern Kansas, were derived from the Canadian Shield. Also present, though much less common, are pieces of hematitic iron ore, probably from the Iron Ranges of Minnesota, and Lake Superior agates from the Keewenawan volcanics of Minnesota, Wisconsin, and Michigan. The presence of these "foreign" rock types in sediments not only constitutes almost incontestable evidence of a glacial origin for the original host deposit, but also provides indication of the direction of ice flow. Although movement may not have had straight-line directness from outcrop source to the locus of final deposition, there could not have been much deviation. Even if one admits the possibility that some clasts were picked up by an early ice-sheet advance, carried only part way to Kansas, deposited, then incorporated into a later glacier, movement from outcrops of Sioux quartzite must have been at least almost direct. The presence of the glacier terminus nearby to the west would seem to preclude any sizable detours (fig. 2). Published here for the first time is a map by J. S. Aber showing locations of striated surfaces and ice-push structures which provide indication of the direction of glacier flow (fig. 3). Correlation of a specific indicator with a specific advance of the ice sheets, or with an advancing or retreating hemicycle, may be difficult or impossible. Orientation of indicator travel paths produced during marked lobation of the ice front may deviate considerably from the regional direction of flow. Figure 3--Map showing directional features for Kansan and other pre-Illinoian glaciations of the lower Missouri basin region. Directional features are, for the most part, not stratigraphically controlled and could relate to any of several pre-Illinoian ice advances. In Kansas, northeasterly ice movement is associated with the lower Kansas till, and north-westerly ice advance is related to the upper Kansas till. Primary data sources include Chamberlin (1886), Todd (1899), Barbour (1900), Norton (1911), Schoewe (1941), Flint (1955), Lammerson and Dellwig (1957), Dellwig and Baldwin (1965), and Aber (1985), plus other published and unpublished sources. Eastern limit of Sioux quartzite erratics from Willard (1980); glacial limits adapted from Flint et al. (1959). Compiled and drafted by J. S. Aber in 1986. The presence of pebbles of Sioux quartzite and other erratic fragments is especially important for interpretation of scattered occurrences of a basal gravel. Most of the clasts are composed of chert or limestone. Indeed, the quartzite comprises much less than 1%. Nevertheless, it is believed that these pebbles could have been carried from outcrops in Minnesota only by glacier ice and their presence is taken as positive proof that this gravel was deposited in association with or after an episode of continental glaciation. As a consequence of the relatively great antiquity of the glaciation of Kansas, no land forms of direct glacial origin have been recognized. Delineation of the limits of glacier advance must, therefore, be based on the extent of sediments of unequivocal glacial origin--those deposited directly by the ice rather than by streams or in lakes adjacent to the ice. In effect, this is accomplished by finding, in the field, the farthest south distribution of till or of fragments of Sioux quartzite which, on the basis of size or topographic location, are believed to have been left by the ice sheet itself without subsequent redistribution by meltwater or floating icebergs, or post-glacial movement by gravity or streams (figs. 4 and 5). Figure 4--Generalized distribution of Sioux quartzite erratics (triangles) and location of the ice margin. Wamego is 3 mi (4.8 km) north of the top of this map. The spillway controlled outflow from Kaw lake and stabilized water level at an elevation of 1,165 ft (355 m). 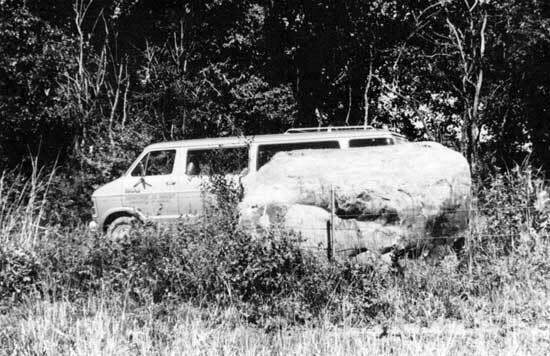 Figure 5--Sioux quartzite boulder 2 mi (3 km) northwest of Dover. Although it is located within the limits of a proglacial lake, its association with till suggests that is was emplaced directly by the glacier rather than rafted on an iceberg. Meltwater streams are capable of transporting only pebble- or perhaps cobble-size masses of frozen till. Somewhat larger bulks can be floated on icebergs, but not enough to form later an extensive deposit. Exposure of unsorted, unstratified till can therefore be accepted as proof of the former presence of glacier ice at a specific locality. In addition, erratic boulders situated on hill tops or ridge crests or anywhere else clearly above limits of proglacial water flowage or impoundments and unaffected by postglacial downslope movement also demonstrate where ice was present. These relationships have been very successfully used in the field to locate the glacier terminus. Along most of the 100-km (60-mi)-long terminal line between Wamego and Topeka, it is believed that the ice-front position can be fixed within a zone at most a few hundred meters wide. In some places the apparent boundary can be placed within less than 100 m (330 ft; fig. 6). This line can be followed across the existing landscape, generally with no apparent topographic control. Figure 6--Limit of glaciation south of Mill Creek valley. Distribution of till and Sioux quartzite erratics (triangles) closely fixes the glacier terminus. The steep-sided ridge on which the glacial debris rests is composed largely of limestone bedrock and is not a true moraine. Behind the terminus there is not a continuous sheet of till. Only scattered patches are present, leading Schoewe to coin the descriptive term "attenuated drift border." Thicknesses vary markedly over short distances. In most places bedrock underlies loessal soil with no till whatever. Locally there are only erratic boulders on a nearly bare bedrock surface. Details of the distribution of till and erratic boulders, especially where found on hill tops and ridge crests, have elicited considerable speculation regarding relationships between present topography and that across which the ice sheets advanced. How much general erosion, or even local dissection, has occurred in postglacial time? A reasonable first assumption is that because the glaciation of Kansas took place at least several hundred thousand years ago, postglacial processes must have been able to modify the glaciated landscape to a considerable degree--whatever that phrase might mean. Indeed, the very patchiness of till has been attributed to just this purportedly extensive removal, and the patches have been spoken of as "remnants." The localized accumulations of Sioux quartzite boulders resting on bedrock have been interpreted as lag deposits, the last, resistant remains of once-thick till. This debate is especially germane to a locality south of Wamego where a short, narrow ridge rises precipitously about 35 m (116 ft) above flanking creek valleys. The flat crest of this ridge is covered by a sea of thousands of small boulders of Sioux quartzite (fig. 7). Exposures on the sideslopes show, however, that this accumulation is a veneer, at most only a few boulders thick, resting on limestone bedrock. Similar ridge-top accumulations of numerous quartzite boulders occur in perhaps half a dozen localities in the marginal zone of the glaciated area of Kansas. 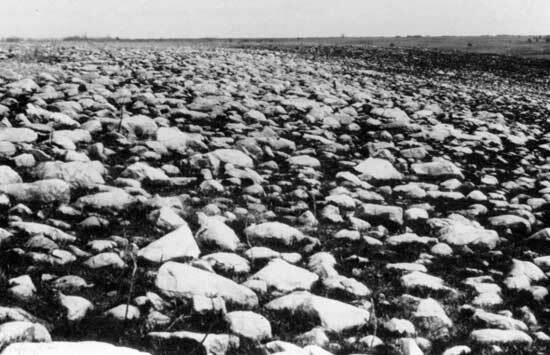 Figure 7--Sea of erratics on the edge of a ridge east of highway K-99, 5 mi (8 km) south of Wamego. More than 99% of these clasts, displaying a remarkably small range in size, are of Sioux quartzite; the remainder are of assorted igneous lithologies. The flat-topped deposit is at most only a few feet thick on top of limestone bedrock. One possible explanation of localized ridge-top felsenmeer would be based on topographic reversal. The hypothetical sequence would begin with deposition of thick, boulder-bearing till on the preglacial landscape. Postglacial drainage would create narrow, steep-sided gullies in this cover. As erosion proceeded, finer constituents of the till would be differentially removed, resulting in a lag concentration of the larger clasts in the gullies. Wherever the original till was especially rich in boulders, the valleys would become choked with them. Subsequently, the quartzite boulder fill would be more resistant to continuing erosion than the flanking limestone bedrock and whatever till cover remained. The boulder-filled gullies would remain essentially unaffected while the limestone hills would be worn away and, eventually, a reversal of topography would result. The former valley floor would then stand high as a boulder-capped ridge. This is a very enticing hypothesis, but some problems remain. Chief among these is an explanation of why modern valley floors, no matter of what size or location relative to the ridge-top felsenmeer, show few, if any, quartzite boulders. It might be expected that in most areas, where quartzite boulders were not sufficiently numerous to form a protective cap on the bedrock, the few boulders present would be moved downslope by gravity and stream-flow and collect in the modern valleys. Such concentrations are rarely found. At sites where the valley floor consists of bare bedrock, it clearly is not possible to suggest that these boulders are indeed present but covered by younger alluvium. Even the boulder beds encountered by wells bored beneath the floodplain of the Kansas River cannot reasonably account for all of the proposed lag concentration. An alternative explanation would begin with a subglacial topography essentially the same as that now present. As the frontal zone of the ice sheet began to thin during the recessive phase, major crevasses could be expected to open above submerged ridges. A few of these might be favorably located so as to receive large numbers of quartzite boulders being carried on or within the ice. Concentrations of boulders would thus accumulate on the crests of a few pre-existing bedrock ridges, remaining there as the flanking ice melted away. One of the problems associated with this hypothesis is the need to explain why the felsenmeer are composed almost entirely of quartzite boulders whereas the glacier was undoubtedly carrying other lithologies as well, as is shown by occurrences of boulders of granite, gabbro, greenstone, basalt, and limestone in other topographic situations. Questions associated with the distribution of Sioux quartzite boulders also arise for an area southeast of Wamego. Boulders of a wide range of sizes are scattered thickly over several rounded hill tops that stand as much as 100 m (330 ft) above the Kansas River (fig. 4). On some of the summits, these boulders are seen to rest directly on limestone bedrock. Are these a residue, the last remnants of till that was originally deposited there? Or are they the only materials that were left by the ice? This is not typical of deposits in areas of younger continental glaciation such as Illinois or Wisconsin. On the other hand, many areas of late Pleistocene or Holocene deglaciation (northern Canada, Norway, Antarctica come to mind) are characterized by widespread exposures of bedrock on which are scattered only small, thin patches of till, or just boulders alone. Another basis on which the amount of postglacial erosion might be estimated is the relationship between the apparent terminal and existing topography. Does the glacial limit seem to follow a generally straight line for considerable distances, crossing valleys, hillside slopes, and ridge crests without deviation, or is it diverted, blurred, or interrupted by these land forms? To answer this question with confidence would require mapping in much greater detail than has yet been accomplished. However, the present impression is that the terminal line is, in general, not affected by details of the topography. Admittedly, there are clear suggestions of a broadly lobate front that advanced into some large lowland areas while being restrained at intervening promontories. But at a smaller scale the line, as defined by the southernmost quartzite boulders in each local area, crosses valleys or ridge crests and is oriented diagonally along slopes with no clear deviation. If this pattern is indeed present, then the preglacial topography must be largely preserved in the present landscape. Major postglacial erosion would have displaced or even obliterated much of the linear record. From the earliest investigations it became accepted dogma that continental ice sheets reached Kansas only twice and that these advances were the first two of four that occurred during the Pleistocene Epoch. It also was believed that nonglacial sediments of late Kansan age could be positively identified by the presence of a layer of the Pearlette volcanic ash. Those concepts have been effectively destroyed by discoveries made during the past 25-30 yrs. Concurrent studies in northeastern Kansas and south-eastern Nebraska found stratigraphic evidence of more than two glacial advances. By the middle 1960's, the Nebraska Geological Survey had formally recognized two Nebraskan tills and two Kansan tills, designations that were at once accepted by the Kansas Geological Survey, even though there were problems of regional correlation (fig. 8, table 1). At the same time, exploration in northeasternmost Kansas found an exposure that contained units indicating five episodes of glaciation separated by deposition of interglacial sediments and formation of paleosols. Discoveries soon followed of similarly complex records of multiple pre-Illinoian glaciations in Iowa, then in Illinois. Figure 8--Limits of purported stadial advances of continental ice sheets (modified from Reed and Dreeszen, 1965). Termini in Nebraska and northernmost Kansas are from Reed and Dreeszen; those farther south are from the geologic map of Kansas and 1986 field mapping by Dort. Locations of designated type sections are shown for Early Nebraskan (EN), Late Nebraskan (LN), Early Kansan (EK), and Medial Kansan (MK). Table 1--Classification of Pleistocene units according to the Nebraska Geological Survey (from Reed and Dreeszen, 1965). This classification also was used by the Kansas Geological Survey. However, studies in many areas have shown that the record is much more complex in Kansas and it is probable that all terms below the Illionian will have to be extensively redefined or, more likely, abandoned. The assumed simplicity of fluctuations in early Pleistocene climate is now known to be wrong. However, it is at present impossible to state how many major glaciations actually occurred or how many lesser advances and retreats marked each of those. It has been established that glacier ice reached the terminal zone in Kansas more than once. Some of the indications are unclear and subject to interpretation, but other evidence seems to be incontestable. At more than a dozen localities spread from west of Topeka to east of Lawrence, exposures of two till units have been found. In each instance these are set apart by a paleosol developed either in the upper part of the lower till or in nonglacial sediments overlying the lower till. Unfortunately, each of these sites has only a thin sedimentary section above bedrock. Therefore, estimating the duration or importance of the interglacial soil-forming interval is difficult, but it may have been relatively short, perhaps only a few thousand years. Whether all of these exposures are of sediments and paleosols of the same age, marking one interglacial interval, or whether the record is more complex also is not yet known. Less certain is the meaning of exposures of what appear to be two till units without any intervening nonglacial sediments or paleosols. These units can be separated on the basis of differing texture, color, and lithology. Most outstanding are occurrences of red, oxidized till with a clay-rich matrix and a high content of erratic clasts, both quartzite and granitic varieties, overlying a tan, unoxidized till with a sandy matrix and almost no erratics. It is currently believed that these units are of distinctly different ages and represent separate advances of the ice, but this interpretation cannot yet be strongly supported with quantitative data. Especially noteworthy is the presence of a few clasts of erratic lithology, notably Sioux quartzite, in chert or chert-limestone pebble gravel that locally underlies the lowest till and also occurs where no till is present. The gravel might be outwash from the glacier that subsequently left the overlying till, as has been proposed frequently in the literature, but there are suggestions that it is considerably older. More puzzling is the presence of a small hill of erratic-bearing gravel and, apparently, till approximately 7 mi (11 km) beyond the supposed terminus of glaciation as indicated by the Sioux quartzite boulder limit. Once it has been shown that more than two identifiable till units occur in northeastern Kansas, a problem in nomenclature arises. Are the additional units assignable to the Kansan glaciation, to the Nebraskan, or to glaciation "X"? The Nebraska Geological Survey solved this quandary by identifying and naming a medial Kansan Cedar Bluffs Till, an early Kansan Nickerson Till, a late Nebraskan Iowa Point Till, and an early Nebraskan Elk Creek Till (table 1). However, distinguishing criteria and age assignments were not based on clear stratigraphic and sedimentologic data. Reliable correlation into Kansas is impossible and will remain so until additional field mapping, augmented by detailed quantitative studies, has been accomplished. Integration of data from deep-sea cores with the terrestrial observations will have considerable influence on development and acceptance of a new classification. It is, however, certain that there must at the very least be a temporal redefining of the names Nebraskan, Aftonian, and Kansan, and the use of stratigraphic names such as Sappa, Grand Island, and Holdredge seems to be unjustifiable in Kansas. Drainage of the northern quarter of Kansas is accomplished mainly by the eastward-flowing Kansas River. Several major tributaries join this trunk stream from the north; those entering from the south are of smaller size. As an ice sheet advanced into Kansas, it progressively covered more and more of the drainage basins of the southward-flowing streams, ultimately obliterating them. The course of the Kansas River from near Junction City to Kansas City closely approximates the southern limit of glaciation. For this reason, it is believed that the Kansas River may have originated as an ice-marginal stream. However, the actual terminal line of ice advance lies several miles south of the Kansas River valley along most of this reach. This means that not only were all northward-flowing tributaries of the Kansas River blocked by the ice front, but almost all of the mainstem valley also was covered by ice. Inevitably, impoundment occurred and a series of ice-front lakes formed. Till can be observed in exposures only a few feet above the present floodplain of the Kansas River. It also has been encountered in drill holes. Therefore, it can be stated that the Kansas River valley was present prior to one or more advances of the glacier. The occurrence of tills of contrasting lithologies near the present valley floor suggests that the valley was present before at least two glaciations. If the Kansas River valley as it exists now is at least a fair approximation of the valley that was over-run by the ice sheets, then the shape of the existing valley should approximate the shape of the lake impounded in that valley upstream from the ice limit. The vertical position of the shoreline would have been controlled by some overflow point. The position of the ice front, as indicated by the distribution of Sioux quartzite erratics, was a short distance south and west of Wamego. Inspection of existing topography outside this limit quickly led to identification of a col that would have permitted water to spill around the blockade. Elevation of the floor of this broad pass is shown on topographic maps as being 1,165 ft (355 m) above sea level. Tracing the 1,165-ft contour then provides the shoreline of the impounded lake, named Kaw Lake by Todd (figs. 9 and 10). Figure 9--Proglacial lakes west of Topeka at the time of maximum ice advance. Shorelines depict water levels controlled by spillways against or close to the ice front. It is believed that there has been no significant warping of the land surface since that time and that the glaciated terrain closely approximated that of today, thus permitting plotting on modern topographic maps. Figure 10--Pro-glacial lakes near Topeka and in the Wakarusa valley. Greatest uncertainty is present where this elevation crosses the floors of major valleys. Postglacial history has undoubtedly included multiple episodes of incision and aggradation, so the location where the 1,165-ft contour now crosses a floodplain probably deviates somewhat from the actual head of any specific arm of the proglacial lake. However, the proposal that bayheads, and consequent delta formation, were indeed present at these general locations is strengthened by Soil Conservation Service recognition there of unusual clay-rich soils that seem to be of possible lacustrine origin. The floor of the spillway at 1,165 ft (355 m) south of Wamego was not deeply entrenched because the valley of Mill Creek directly east was occupied by a lake having a surface elevation only slightly lower. Indeed, there may have been a drop of as little as 5 m (17 ft) through the 50-km (30-mi)-long series of small lakes that were present along the ice front eastward to Topeka. Well established in published literature is the hypothesis that water impounded when the Kansas River valley was blocked by glacier ice rose until it was able to spill westward and southward through the so-called McPherson Valley. As early as 1895, Beede pointed out that such a course on the present topography would require water to flow uphill. A solution suggested in later papers was to call on an isostatically raised glacial forebulge to provide a gradient in the proper direction. This suggestion does not withstand close analysis, however, and westward drainage of Kaw Lake apparently did not take place. Compilation of subsurface data provided by drill holes does indicate the presence of several buried valleys in northeastern Kansas. However, relating these to the glacial chronology has been handicapped by previous efforts to fit all events into a framework of only two major glaciations of the area. As additional information is acquired, it will probably be found that there was a considerably more complex sequence involving several advances of the ice sheets. Any situation involving impoundment of large volumes of water by an ice dam contains the ingredients necessary for release of one or more catastrophic floods. If blockage continued at the western end of the Kansas River valley after the area around Topeka had become ice free, ultimate failure of that dam could have released a surge of water and sediment down the deglaciated portion of the valley. Large-scale trough crossbeds in a gravelly sand exposed in a pit just northwest of Topeka might have been formed by such an event. Furthermore, the deep inner bedrock gorge extending more than 60 m (198 ft) below present floodplain level in the Kansas City area could also have been formed, at least in part, by this high-volume discharge. One other interesting question about Pleistocene drainage relates to the ancestral Missouri River or its precursor. When ice sheets reached northeastern Kansas, all preglacial drainage toward the northeast was effectively blocked. So also was the Missouri River itself, or whatever trunk drainage existed at that time. Yet there still was a vast region in the interior of the continent that received precipitation, as well as at least some flow from the ice itself. That water had to go somewhere. Flow toward the north and northeast was blocked by ice; toward the west or southwest it was blocked by higher elevations. There seem to be only two possible courses available. Flow might have been diverted through the McPherson Valley, a possibility previously mentioned and discarded, or it could have followed a general ice-marginal route. This latter possibility seems best, but confirmation is frustrated by the absence of a readily identifiable ice-marginal valley large enough to carry drainage from the entire Midcontinental area. It may well be, however, that the broad and deep bedrock valley of the Kansas River, now filled by alluvium to depths of about 30m (99ft) away from the narrow inner gorge was carved by this stream and that glacier advance south of the valley, thereby blocking this drainageway, was only short lived. Study of the Pleistocene history of Kansas is once more in a stage of rapidly expanding knowledge. Recognition of the multiplicity of glacial episodes and of ashfalls from distant volcanoes has made it necessary to revalidate or, more generally, modify previous concepts of stratigraphic relationships. Every sequence or correlation that was published prior to 1960 must be critically re-examined. This is clearly a time of change, but it is to be hoped that the urge to rush into print with new ideas will be tempered by the need for careful testing of hypotheses. Aber, J. S., 1982, Two-ice-lobe model for Kansas glaciation: Nebraska Academy of Science, Transactions, v. 10, p. 25-29. Aber, J. S., 1984, History of Kansas glacial geology: Earth Sciences History, v. 3, no. 2, p. 134-142. Bayne, C. K., 1968, Evidence for multiple stades in the lower Pleistocene of northeastern Kansas: Kansas Academy of Science, Transactions, v. 71, p. 340-349. 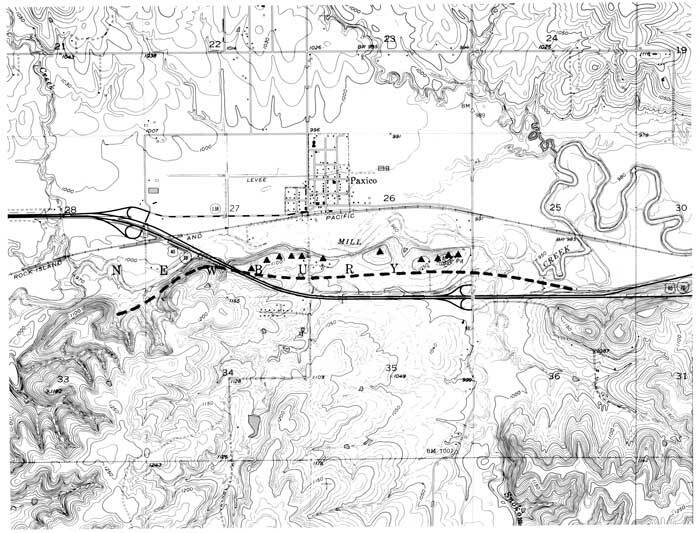 Bayne, C. K., and Fent, O. S., 1963, The drainage history of the upper Kansas River basin: Kansas Academy of Science, Transactions, v. 66, no. 3, p. 363-377. Beede, J. W., 1895, The McPherson Equus beds: Kansas Academy of Science, Transactions, v. XV, p. 104-110. Boellstorff, J., 1978a, A need for redefinition of North American Pleistocene stages: Gulf Coast Association of Geological Societies, Transactions, v. 28, p. 65-74. Boellstorff, J., 1978b, Chronology of some late Cenozoic deposits from the central United States and the ice ages: Nebraska Academy of Science, Transactions, v. 6, p. 35-49. Dort, W., Jr., 1966, Nebraskan and Kansan stades--complexity and importance: Science, v. 154, no. 3,750, p. 771-772. Dort, W., Jr., 1972, Stadial subdivisions of early Pleistocene glaciations in central United States--a developing chronology: Boreas, v. 1, no. 1, p. 55-61. Hay, R., 1893, Some characteristics of the glaciated area of northeastern Kansas: Kansas Academy of Science, Transactions, v. 13, p. 104-106. Lohman, S. W., and Frye, J. C., 1940, Geology and ground-water resources of the "Equus beds" area in south-central Kansas: Economic Geology, v. XXXV, p. 839-866. Mudge, M. R., 1955, Early Pleistocene history of Wabaunsee, southeastern Riley, and southern Pottawatomie counties, Kansas: Kansas Academy of Science, Transactions, v. 58, no. 2, p. 271-281. Mudge, M. R., and Burton, R. H., 1959, Geology and Wabaunsee County, Kansas: U.S. Geological Survey, Bulletin 1068, 210 p.
Reed. E. C., and Dreeszen, V. H., 1965, Revision of the classification of the Pleistocene deposits of Nebraska: Nebraska Geological Survey, Bulletin 23, 65 p.
Schoewe, W. H., 1924, Glacial erratics in Shawnee, Douglas, and Johnson counties, Kansas: Kansas Academy of Science, Transactions, v. 31, p. 106-109. 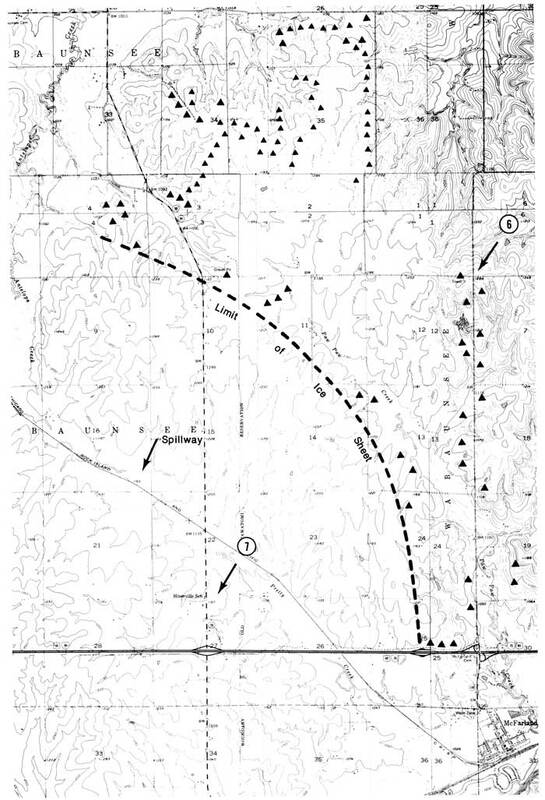 Schoewe, W. H., 1930, Evidence for a relocation of the drift border in eastern Kansas: Journal of Geology, v. 38, no. 1, p. 67-74. Schoewe, W. H., 1939, Evidence for the relocation of west drift border in eastern Kansas: Kansas Academy of Science, Transactions, v. 42, p. 367. Smyth, B. B., 1896, The terminal boulder belt in Shawnee County: Kansas Academy of Science, Transactions, v. 14, p. 220-226. Smyth, B. B., 1898, The buried moraine of the Shunganunga: Kansas Academy of Science, Transactions, v. 15, p. 95-104. Todd, J. E., 1911, History of Wakarusa Creek: Kansas Academy of Science, Transactions, v. 23/24, p. 211-218. Web version updated March 10, 2010. Original publication date 1987.